Recent analysis of a survey of a segment of millennials, those born between 1980 and 1984, found that 90% moved out of their parents’ household by age 27. Of those moving out, however, over 50% returned. This return is sometimes referred as “Boomeranging,” moving out of a parental home and back. This experience has implications for household formation that are at this point unknown but worth exploring. BLS research by Judith Dey and Charles Pierret takes a step in furthering our understanding of boomerang households. 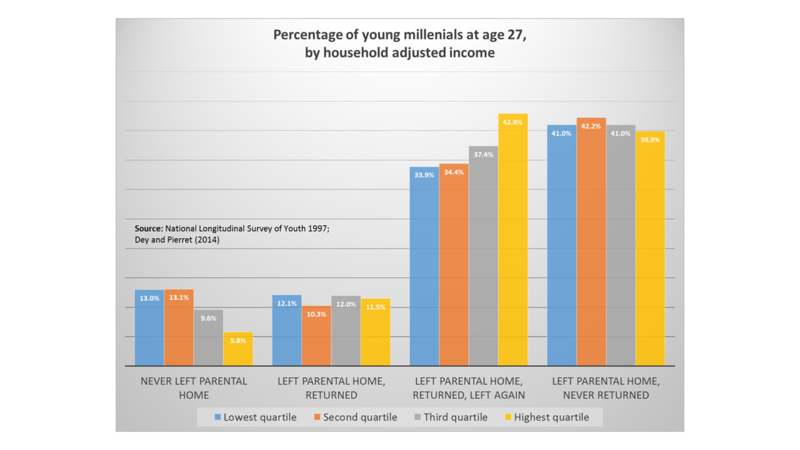 The authors use data from the National Longitudinal Study of Youth 1997 (NLSY97) to examine differences in the return to the parental home by gender, educational attainment, and parental household income. The NLSY97 is a panel survey of a nationally representative sample of nearly 9,000 youths. The youth were surveyed on an annual basis from 1997 through young adulthood. The analysis of Dey and Pierret reveals that the share of women returning to the parental home (50.9%) is slightly higher than the share of men returning to the parental home (47.7%). There are, however, two important considerations. The first is that men are less likely to leave the parental home in the first place. 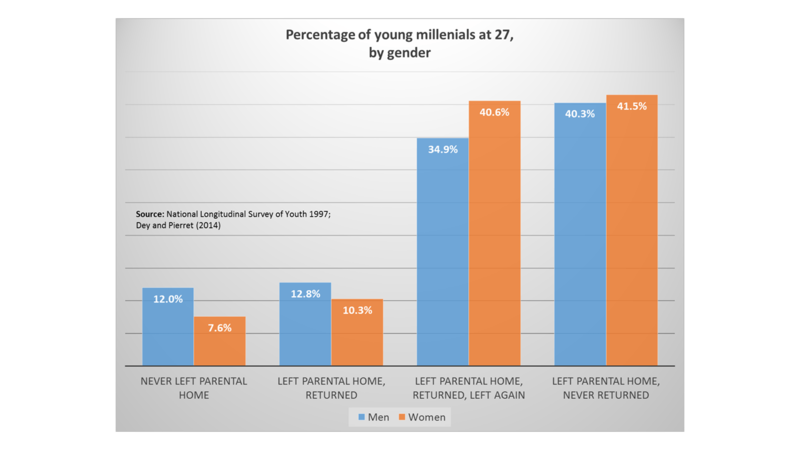 For men, 12% never left the parental home, whereas 7.6% of women never left the parental home. Secondly, although women are more likely to boomerang, they are also more likely to leave again. Another interesting result from the research is that nearly one in four men born between 1980 and 1984 lived at the parental home at age 27. For women, the share of women born between 1980 and 1984 living at the parental home at age 27 was lower at 18.9%. One plausible explanation for the observed differences by gender is the persistent difference in age at first marriage by gender. Marriage is often a critical component of household formation and leaving the parental home. The median age at first marriage has increased steadily for men and women since the 1960s, however, the median age at first marriage for men is about 2 years older than the median age at first marriage for women. 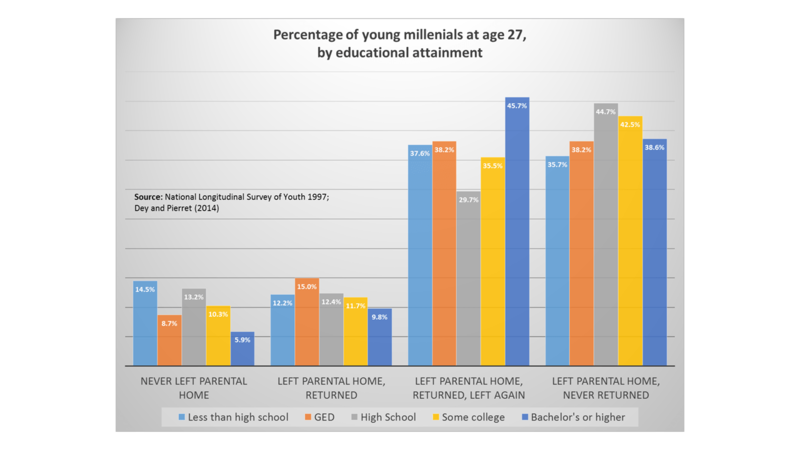 In terms of leaving the parental home and educational attainment, the study reveals differences but no clear relationship. Instead, those born between 1980 and 1984 with a Bachelor’s or higher had the highest share returning to the parental home at 55.5%. This was largely driven by the large share (45.7%) with Bachelor’s or higher that leave the parental home, return, and leave again. An example of this could be a millennial graduating and living at home for a short period of time while looking for employment and leaving again. Those in born between 1980 and 1984 with a high school degree had the lowest share returning to the parental home at 42.1%. This group also had the highest share that left the parental home and never returned (44.7%). In terms of returning to the parental home and parental household income, the study reveals differences and a positive association between the two. Those parents in the top half of the income distribution experienced a higher occurrence of boomerang children than those in the bottom half. Those in the highest quartile had the highest share returning home at 54.4%. Again, this was largely driven by the large share (42.9%) that leave the parental home, return, and leave again. Those in the second lowest quartile of parental household income had the lowest share returning to the parental home at 44.7%. The bottom half of the income distribution, however, had a higher share that never left parental home in the first place. Although this age group is delaying household formation, millennials represent a key demographic for the housing market. Several attitudinal surveys show that the desire to own a home remains strong for millennials despite coming of age during the Great Recession. Understanding the make-up of those that return home could shed light on the timing of the release of this pent-up demand for housing. If anything, the study by Dey and Pierret show that many who return to the parental home leave again. Those leaving again tend to be educated and from the highest income distribution. Thus the data may indicate that while these individuals delay in terms of achieving typical life milestones, the combination of resources and education, plus typical housing preferences, suggest growing housing demand in the years ahead.